If the Age of Sail has a specific expiration date, October 20th, 1827 is it. This is when the Battle of Navarino, the last battle ever to be fought entirely between sailing vessels, occurred. After this date, while some navies retained a few sailing ships because they could not afford the expense of new steam technology, our beautiful and much beloved square-rigged brigs, frigates and ships of the line were considered anachronisms. It was truly the end of an era. Naval historian and Particular Friend Mackenize Gregory breaks down this momentous battle for us. From the 15th century, Greece was ruled and was under the thumb of the Ottoman Turks. Although the Greeks were in revolt several times, they continued to be defeated. In 1821 a Greek revolt again began, to be followed by several years of guerilla warfare, and reprisals by the Turks. It all culminated in the Battle of Navarino with the Turko Egyptian fleet being smashed and Greece being founded as an independent nation. In trying to throw off the Ottoman yoke, the Greeks had since 1821 been in open conflict with the Tukish occupation. In 1827 it appeared that the Greek revolt would fail, but Great Britain, France, and Russia by the Treaty of London had all combined to intervene on the side of Greece. By October in 1827, the combined Turkish Egyptian fleet was based at Navarino in the Peloponnese. Vice Admiral Sir Edward Codrington would head an Allied fleet from Britain, France and Russia (their ships needed to sail from the Baltic as the Dardenelles were closed to Russia). 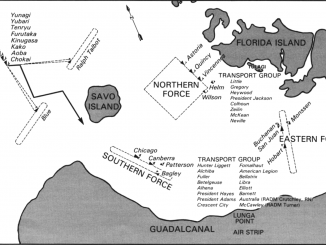 By October 14, 1827, the combined ships of the Allied force made up 11 ships of the line, 9 Frigates and smaller craft, and they arrived off Navarino. The Bay, a wide crescent is blocked by the long narrow islet of Sphaecteria, leaving only a narrow channel that allows access to the bay. Turkish land batteries command this entry point. The Turkish/Egyptian ships were drawn up in parallel lines along the curve of this bay crescent, and were anchored. Any enemy ships that would survive the onslought of the shore batteries would then be met by concentrated fire from the Turkish/Egyptian vessels. We must be aware that at this time there was no formal state of war between the Allies and Turkey or Egypt. Codrington now prepared to sail his force into the bay, assuming the land batteries would not open fire on his ships. He could then anchor his ships in single line parallel to the Turkish/Egyptian force. Codrington at 1400 ( 2 PM ) on October 20 took his fleet into Navarino Bay, to show his peaceful intent, all gun ports were closed, and bands played on deck. Egyptian Ibrahian Pasha in command warned Admiral Codrington he had no permission to enter the bay, and demanded a withdrawal. Codrington haughtily replied ” I am here to give the orders, not to take them.” and followed up by stating if the Turks/Egyptians opened fire he would destroy their fleet. His flagship Asiaanchored astern of two French ships, then in line were Genoa and Albion, two more French ships, the Russian fleet anchored in line directly in the rear, and blocking the Western arm of the Turkish/Egyptian fleet. The Eastern arm of the bay was covered by Dartmouth and the frigate Rose. HMS Cambriananchored between the harbour defences and the shore fort, whilst Glasgow and Talbot were ready to join Cambrian to engage if necessary any of the shore batteries. Dartmouth sent off a boat to request that a Turkish fire ship be moved, but it was met with musket fire killing Lieutenant Fitzroy. A second boat carrying a formal request to Ibrahim Pasha to end all land fighting and conform to an armistice, was also fired on, killing the Fleet Pilot. Admiral Codrington now had all the provocation he needed, Asia opened fire on two, now enemy battleships, and then the combined fleet poured gun fire into the Turkish/Egyptian ships. The Allies although outnumbered in ships had superior fire power, better trained personnel, as the battle raged for four hours. The Turks and Egyptians were hamstrung by the outer line of their ships impeding the line of sight of the guns in the next two lines. It was akin to Shooting fish in a barrel for the allies. Cambrian in the harbour entrance and Glasgow beyond her, sent broadsides into the land defences, it was all planned brilliantly, and by 1800 ( 6 PM ) it was all over, and fire ceased. Out of 78 enemy ships only 8 were still afloat, the rest sunk, blown up, beached or dismasted. The allied ships had destroyed the opposition. Turks/Egyptians had 3,000 killed and another 1,100 wounded, the allied casualities reported as 181 killed and 480 wounded, but no ships were lost, although three needed to go home to England for repairs. Codrington’s actions caused a large diplomatic incident, by opening fire (although provoked ) when no state of war existed. He was recalled to London and though censured the Commons and Lords disagreed, he was cleared of disobeying orders and was soon awarded a Knight Grand Cross in The Most Honourable Order of the Bath (GCB). The Russian Turkish war of 1828-1829 led to Turkey being expelled from Greece and then the emergence of an independent Greek nation. 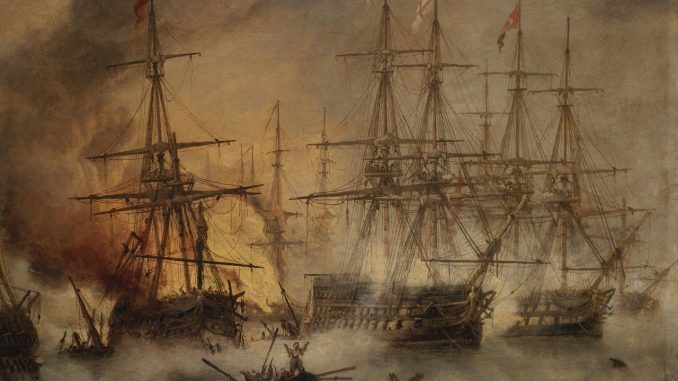 The Battle of Navarino was the last major naval battle to be fought entirely by sailing ships, thus an era had ended.